Summer…y'all, it suddenly seems like we're in the thick of it now. The watermelons, squash, hot peppers, eggplants and tomatoes are all starting to roll in, and everyone's obsessed with cooking out. That always begs the eternal question, "What does a vegetarian eat at a BBQ?" As you likely know if you've been here before, we have a few ideas about that. 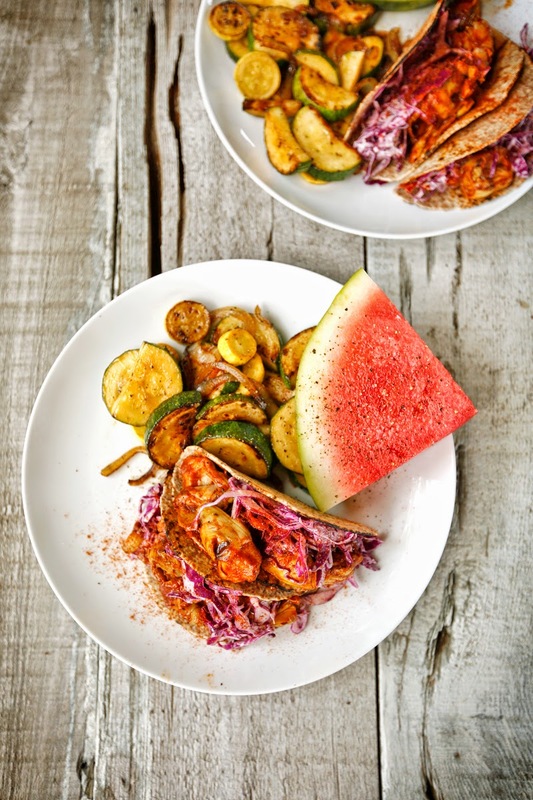 We wanted to give you something brand new for the upcoming 4th of July holiday this Friday, hence the BBQ Artichoke Heart Tacos we just had for lunch today. But we also wanted to recap some of our favorites for you, offer some choices, you know, because this is America, and we love freedom and everything like that. All of these recipes are simple to execute and are made from whole foods. The transformation from boring old vegetable to main dish comes when the smoke and fire infuse summer's bounty with flavor. So, in closing, we're wondering…what are you planning to grill this weekend? Leave a comment and let's get some ideas going! This BBQ Portobello Mushroom Sandwich is always a favorite. We got the original recipe from Memphis's own Central BBQ, so you know it's good. These BBQ Spaghetti Squash Ribs are fun, and they can easily be transformed into BBQ sandwiches if you'd prefer! Our Charred Carrots Dogs have won over many. Some readers even say that this recipe trumps the taste of a real hot dog! Eggplant is absolutely amazing grilled. We have lots of recipes to prove it like our Grilled Andouille Eggplant Po Boy and our very popular BBQ Eggplant Sliders with Caesar Coleslaw, or our recipe for Italian-Style Eggplant Sausages that was recently featured on Buzzfeed. There is no better way to start making a smoothie than feeling the heft of a cleaver in your hand and bringing it down onto a young coconut. The thud is satisfying, and the rush of cracking into the tough outer shell to get to the lightly salty coconut water and the soft, rich meat is worth all the effort. As a vegetarian, this is about as close to butchery as I'm gonna get. And I have to admit, butchering a coconut is pretty fun! Go look for a young coconut -- but know that they're not the classic-looking brown, hairy coconuts that monkeys carry around in cartoons. They're white on the outside and usually shaped into a cone at the top. Young coconuts have more water in them, and the meat is softer, almost jelly-like, and it's easy to scrape out with a spoon. Once you've opened the coconut, you can make our new favorite smoothie using this amazingly healthy, loaded-with-electrolytes ingredient. 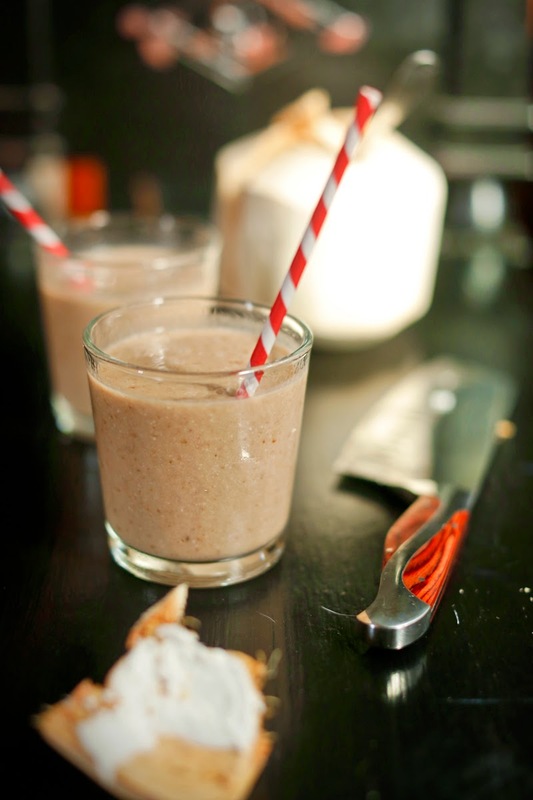 We use cocoa powder to give it a chocolatey flavor and sweeten it with banana and dried dates. To crack open the coconut: set it on a steady cutting board, take a cleaver or large knife in your dominant hand, put your other hand behind your back -- DO NOT EVER STEADY OR HOLD THE COCONUT WITH YOUR OTHER HAND! -- and patiently chop the cleaver into the top of the coconut four times, thus making a square. 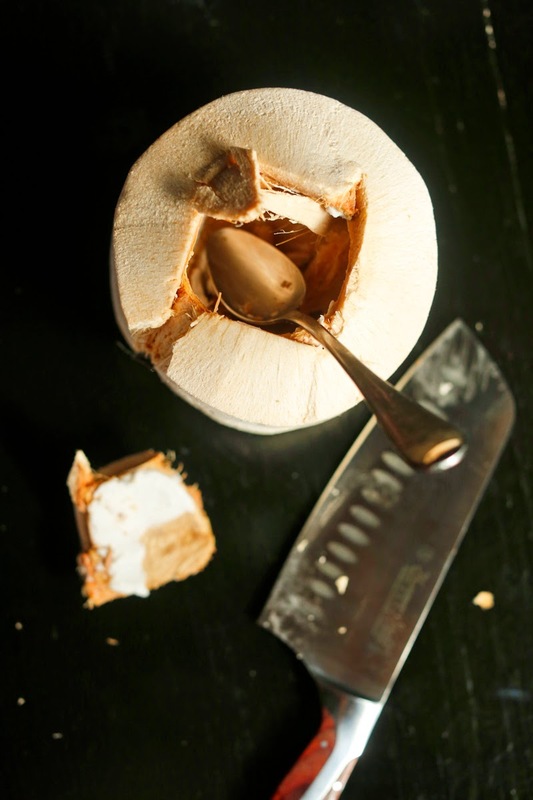 Using the tip of your cleaver, pry the cut part away to reveal an opening in the top of the coconut. Here's a quick video! We go a little crazy when berries finally arrive at the farmers markets and then think, What in the world are we going to do with two flats of these? We froze them and used them for this! 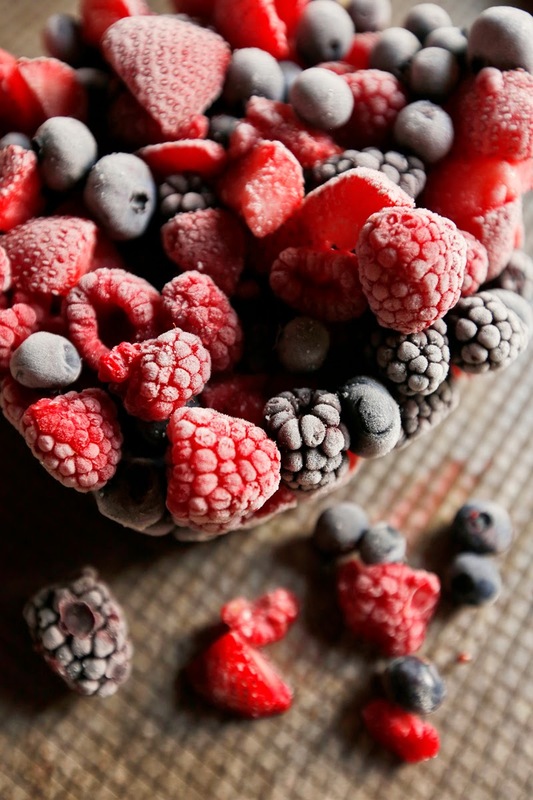 Frozen berries tend to work better for it because they seem to give off less juice during the baking process, and they also come together well without a thickening agent added. 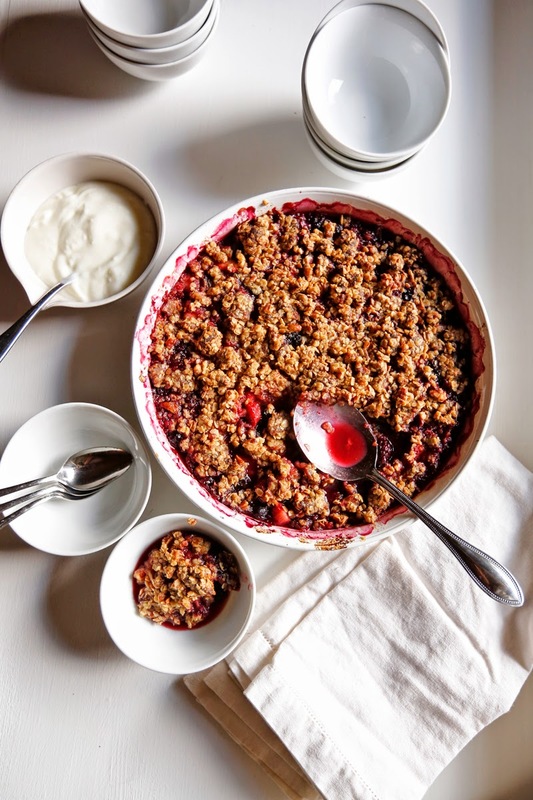 So for the Father's Day pizza & potluck lunch over here last weekend, a big old summer berry crisp seemed just the thing to do. Whenever you're planning have a big crowd over for your next summer get-together, know that this recipe serves at least 10 folks (if that's too many, just halve it) and that it's really easy to throw together the morning of the party. It's got some good nutritional elements, and it's great with ice cream or Greek yogurt on top or even just by itself. Preheat oven to 350 degrees. Microwave the frozen berries for a minute or so and then you can mix them easily. Drizzle the honey over the berries and stir it in so that it coats them. Sprinkle the salt over them and add the lemon juice and stir again to combine. Brush a little olive oil or coconut oil on the bottom and sides of your baking dish(es) -- we used two for this recipe. Spread out the fruit in about a one-inch layer and bake it by itself for 10-15 minutes while you put the topping together. Talking to Sabine about borscht while I was taking photos at ECCO on Overton Park the other day made me start to think about what all I would do with this traditional dish. So we thought about it, looked up a few recipes to glean the basic structure of borscht…and then we decided to just take it all apart. 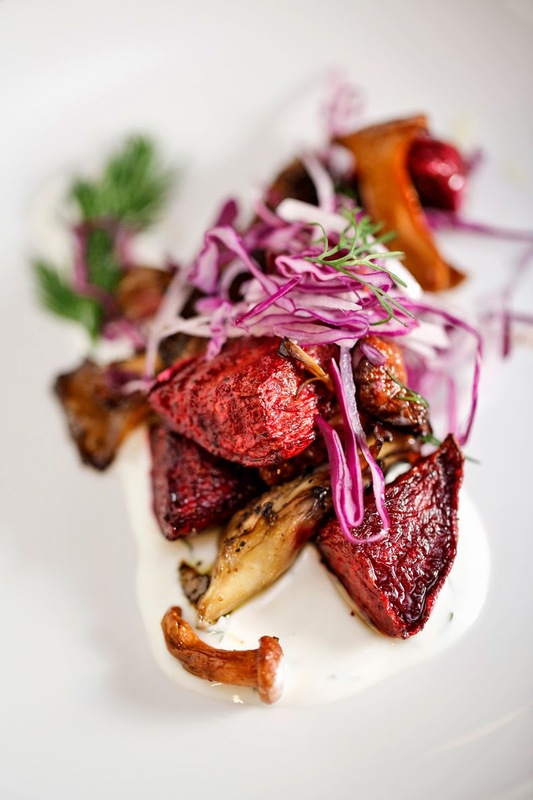 It's earthy as all get out with a good mix of mushrooms, sweet due to the beets, and tangy from the lemon, dill, and yogurt sauce. Maybe the presentation makes it look complicated, but it's simpler than it looks to make since it's basically making a dressing, putting veg in the oven, and whisking a sauce. We picked up the beets from Brandon at Delta Sol Farm last weekend at the Cooper-Young Community Farmers Market. If you haven't stopped by yet, you really should check it out this Saturday! It's easy to park close, quick to run through and survey the goods, and you'll probably have the opportunity to catch up with a lot of nice folks you know while you shop. We like the relaxed, low-key tone there, and we're so proud of our friend Caitlin and all she's doing to make it a great experience. There are great vendors with stuff that'll give you all kinds of ideas about what to make this Saturday for dinner outside or for an excellent Father's Day meal. So, a plan has been forming around here lately. Really, one of the best things about summer is not having any sort of regimented meal planning at all and just letting all the amazing produce that's out there in abundance be the guiding factor in what you decide to cook. This summer, we want to do a post each week or two about what we're using from the many Memphis farmers markets all over town and what we've been inspired to make with our purchases. We'll see what's up next! In a small bowl, whisk together the olive oil and vinegar to create a simple vinaigrette. Toss the beets with half of the vinaigrette and place onto a parchment lined baking sheet and into a cold oven. Turn the oven to 400 degrees and allow beets to cook for 20 minutes. Toss the mushrooms with the other half of the vinaigrette and season them with salt and pepper. 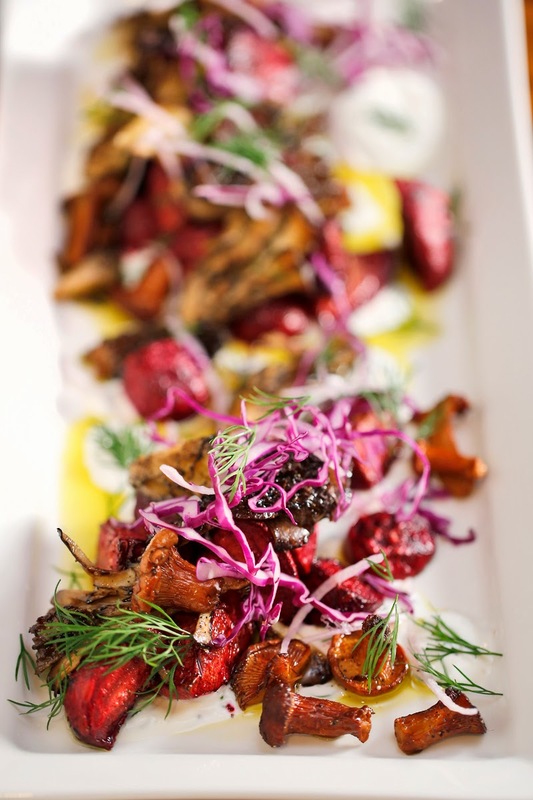 Spread mushrooms onto a separate parchment-lined baking sheet and into the oven alongside the beets for 15 minutes. It's pretty fun to have two heaping cups of vegetables hiding in something sweet -- truly, this is a cake that's not as savory as you might expect it to be. Love this because we're very slyly planning to fit tons of summer vegetables into every meal this season, and we've been mulling over some new ideas for using all kinds of vegetables in desserts. 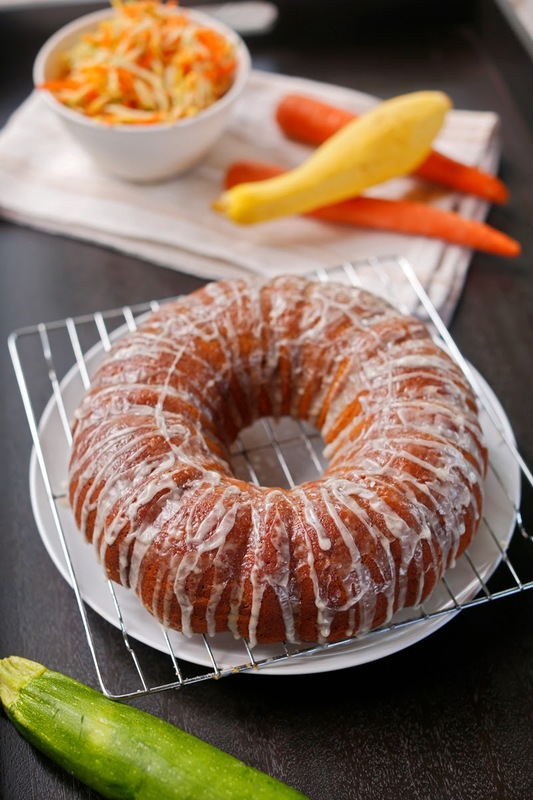 This cake was made using Alisa Huntsman's amazing recipe for Zucchini-Carrot Bundt Cake -- there are vegan and non-vegan versions of it on her site. We love the 'get excited for gardening -- 'cause there's cake!' bribery aspect in her story behind the recipe. Now I want to make some other things from her blogs, Easier than Pie and now Will Garden for Cake and get ahold of her cookbooks. Preheat oven to 350 degrees. Grate carrots, yellow squash, and zucchini using a box grater or run them through the food processor with a grater blade. (You will need two cups total.) Set aside. Whisk together the milk, eggs, coconut oil, and sugar and set aside. Whisk together the flour, sea salt, baking powder, and pumpkin pie spice and set aside. Now add the flour mixture to the wet ingredients and stir to combine. Add the vegetable mixture and gently fold it into the batter. Spread cold butter into bundt pan and dust it with flour. Pour in the cake batter and place pan into the oven. Bake for about an hour or until knife inserted into cake comes out clean. Let cake cool and shake pan a bit after 5 minutes to loosen cake. Wait another ten minutes after that and then place a wire rack on top of the bundt pan then flip the cake onto the rack. Place a plate or cutting board underneath it. Drizzle the cake with Lemon-Vanilla Glaze while it is still warm and let it cool completely before slicing it. Whisk until mixture is the consistency of honey and set aside for drizzling over warm cake.